Figure 1 from the paper. 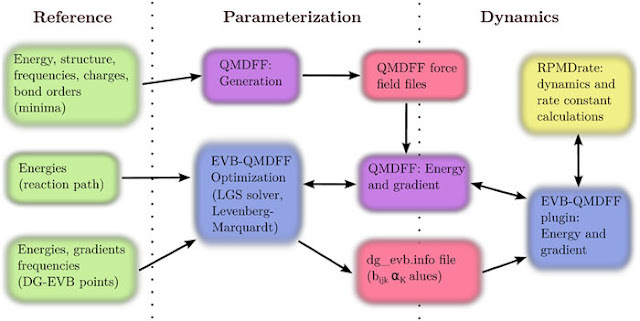 A flowchart of the EVB-QMDFF program implemented in this work, for the case of a DG-EVB-QMDFF calculation. A few years ago I highlighted Grimme's General Quantum Mechanically Derived Force Field (QMDFF) - a black box approach that gives you a system-specific force field from a single QM Hessian calculation. I missed the fact that Hartke and Grimme extended this approach to TSs using EVB, a year later. This EVB-QMDFF approach constructs EVB potentials connecting each pair of minima described by QMDFF. To get the EVB parameters you need to supply the TS and 10-100 energies (and possibly 5-10 Hessian calculations) along the reaction path, depending on how complex an EVB potential is needed to describe the reaction. What's the point of a system-specific reactive force field when you already have the TS and reaction path? Well, Steffen and Hartke show is that EVB-QMDFF can be used to perform the additional calculations needed for, for example, variational TS theory or ring polymer MD calculations to get more accurate rate constants. Furthermore, just like for QMDFF for minima you could do all this for one conformation of ligands and use EVB-QMDFF for a conformer search or use the gas phase parameterized model to study the effect of explicit solvation. It might even be possible to parameterize EVB-QMDFF using small ligands and then model the effect of larger ligands using the QMDFF parameters obtained for the minima. However, all these potential uses still need to be tested. Reprinted (adapted) with permission from Dorothea Golze, Marcella Iannuzzi, and Jürg Hutter. Journal of Chemical Theory and Computation, 2017 ASAP, Copyright 2017 American Chemical Society. CCH has been been around for about five years and it's time to shake things up a bit in terms of how to contribute. Anyone at any level of their career. If you write a good highlight (in my opinion) then I'll post it (see below). You don't have to be an expert in the subject of the highlight. For example, I frequently highlight papers that use machine learning because I find it fascinating and want to learn about it, but I have yet to publish in that area. In general, I would like CCH to be a diverse as possible in terms of subjects, career-stage, gender, geography, etc. For example, the current highlights are mostly on small molecule, electronic structure-related papers and I'd love to have some more highlights on solid state and dynamics. But more small molecule, electronic structure-related highlights are also fine. If you are interested in contributing highlights to CCH send a highlight in any format to compchemhighlights@gmail.com. If I like it, I'll post it. If you continue to send me highlights on a fairly regular basis (e.g. one every 2-3 months), then I'll add you to the editorial board and give you access to the site so you can post yourself. If you make it on to the editorial board but don't post highlight a 12 month period, I'll remove you from the editorial board again. This also goes for current editors, from today on. Note that you don't commit yourself to be a regular contributor by sending a highlight. Contributing once is just fine. You can also post a highlight on your own blog and send me a link for cross-posting. What are the requirements for a highlight? You can't highlight a paper you have co-authored. The paper should be published within the current year, or last two years. So in 2017, the paper must be published in 2015-2017. You should highlight papers you (mostly) like and agree with - not papers of which you are highly critical. You need at least a sentence or two on why you think the paper is interesting, and it should be of general interest to some fairly large subgroup of computational chemists. One thing I am not interested in is a steady stream of papers related to a very specific subject. It is fine to highlight a preprint that has been deposited but not accepted or published yet. As mentioned above, CCH has been around for about five years. CCH receives about 2200 page views per month, has about 450 Twitter followers, 1000 Facebook likes, and 330 followers on LinkedIn. Medvedev, et al. have examined the cyclization step in the formation of Spinosyn A, which is catalyzed by the putative Diels-Alderase enzyme SpnF.1 This work follows on the computational study done by Houk, Singleton and co-workers,2 which I have discussed in this post (Dynamics in a reaction where a [6+4] and [4+2] cycloadditons compete). In fact, I recommend that you read the previous post before continuing on with this one. In summary, Houk, et al. found that a single transition state connects reactant 1 to both 2 and 3. The experimental product with the enzyme SpnF is 3. In the absence of enzyme, Houk, et al. 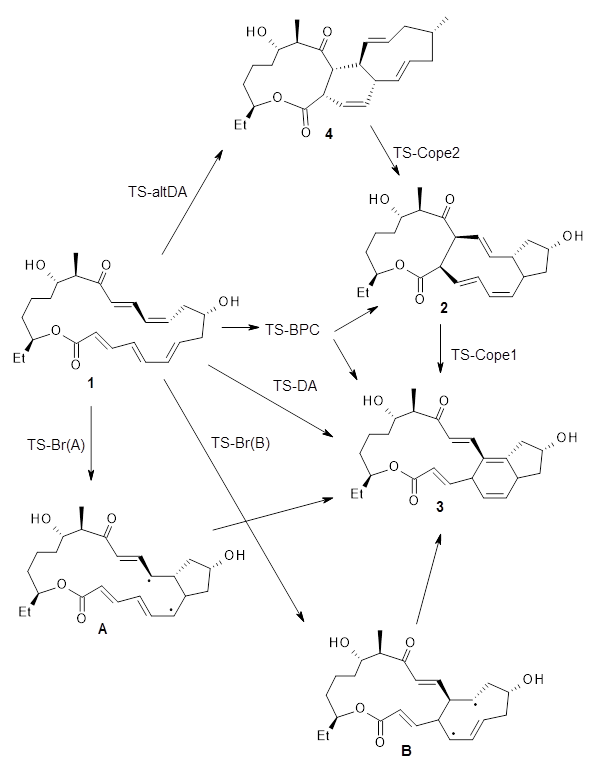 suggest that reactions will cross the bispericyclic transition state TS-BPC (TS1 in the previous post) leading primarily to 2, which then undergoes a Cope rearrangement to get to product 3. Some molecules will follow pathways that go directly to 3. They also examined two alternative routes. First, they propose a path that first takes 1 to 4 via an alternative Diels-Alder reaction, and a second Cope rearrangement (TS-Cope2) takes this to 2, which can then convert to 3 via TS-Cope1. The other route involves a biradical pathway to either A or B. These alternatives prove to be non-competitive, with transition state energies significantly higher than either TS-DA or TS-BPC. Returning to the set of TS-DA and TS-BPC transition states, while the former are more numerous, the latter are lower in energy. In summary, this study further complicates the complex situation presented by Houk, et. al. In the absence of catalyst, 1 can undergo either a Diels-Alder reaction to 3, or pass through a bispericyclic transition state that can lead to 3, but principally to 2 and then undergo a Cope rearrangement to get to 3. The question that ends my previous post on this subject — “ just what role does the enzyme SpnF play?” — remains to be answered. 1) Medvedev, M. G.; Zeifman, A. A.; Novikov, F. N.; Bushmarinov, I. S.; Stroganov, O. V.; Titov, I. Y.; Chilov, G. G.; Svitanko, I. V., "Quantifying Possible Routes for SpnF-Catalyzed Formal Diels–Alder Cycloaddition." J. Am. Chem. Soc. 2017, 139, 3942-3945, DOI: 10.1021/jacs.6b13243. 2) Patel, A.; Chen, Z.; Yang, Z.; Gutiérrez, O.; Liu, H.-w.; Houk, K. N.; Singleton, D. A., "Dynamically Complex [6+4] and [4+2] Cycloadditions in the Biosynthesis of Spinosyn A." J. Am. Chem. Soc. 2016, 138, 3631-3634, DOI: 10.1021/jacs.6b00017.